Can I get divorced without telling my spouse? Can I obtain a divorce without telling my spouse?’ was among the questions I received from listeners when I recently appeared on BBC Radio Leeds ‘The Professionals’ with Richard Stead. There may be numerous reasons why you ask this question. It could be because your husband or wife has left without providing support for you and your children, or that you are concerned about how they would react. In the majority of cases the answer is “No” – although there are exceptions. You can apply for a divorce if your husband or wife ‘lacks mental capacity’ and is unable to agree to a divorce or take part in the divorce proceedings. In such cases your spouse will require someone called a ‘litigation friend’ – a family member or close friend who acts on their behalf. In circumstances where a spouse has disappeared, without anyone knowing where he or she is living or working, it may also be possible to obtain a divorce without their knowledge. Success, however, is dependent on you proving to the court that, having filed a divorce petition (the first step in every divorce), you have done everything possible to locate and serve them the petition, but have been unsuccessful. If the court agrees, you can apply for an order to dispense with serving the petition – as long as it is supported by comprehensive evidence that you have left no stone unturned to contact your spouse’s friends, relatives, previous employers and banks. If you are in a situation where you are scared or concerned about your spouse’s reaction – or if there is a history of domestic abuse – you can ask the court to omit your address from a divorce petition. However, because the court takes service of court documents very seriously, it will not make an order dispensing with serving the petition altogether without very careful consideration. 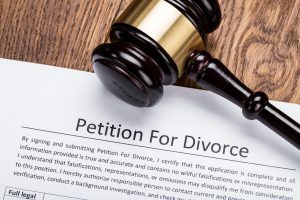 Ultimately, in the vast majority of cases, procedure demands that the other spouse is served with a petition and is therefore aware of what is happening. In divorce, every case is different and it is important to choose the right lawyer for the complex and sensitive area of relationship breakdown.